Visiting big tourist sights can be a blow to any travel budget – backpacking or not. Macchu Pichu is no exception, with many tour agencies quoting upwards of $300 USD to visit the ruins. With it's reputation as the gem of Peru’s tourist sights, you may think this price is warranted. It’s a mysterious, hidden city, precariously perched on the top of a mountain in the middle of the jungle… Sounds hard to get to, right? Well, after much research, we did it on the cheap and managed to do everything for less than $100 USD. This includes hiking a shortened version of the Salkantay Trek without a guide, and spending an entire morning at Macchu Pichu. Clear skies! The view after going over the Salkantay Pass. Day 1: Soraypampa to Chaulley. Catching glimpses of snow-capped mountains going over the Salkantay Pass. Day 1: Spend the night in Chaulley, a little village in the jungle where you can camp or get a bed. Hidroelectrica Train Station: The start of the (very long) walk along the train tracks to Aguas Calientes. Hiking through the jungle along the train tracks to Aguas Calientes. New friends! Llamas of Machu Picchu. View from the top: Looking down onto the train tracks below. And let's be clear: you do not need any hiking experience to do this trek without a guide. You can stay in guesthouses or hostels along the way, the hiking is non-technical, and the trail well-marked. With the instructions below and a good GPS map, it's really straightforward and rewarding for both novice hikers and pros. And did I mention Machu Picchu is the prize at the end?! Let’s get to the logistics! 4. My experience hiking in December – rainy season! 10. Do you need a guide to visit Machu Picchu? My friend from Australia was traveling with us at the time, and had limited days in Peru, so a shorter trek made sense. From all our research and speaking to other people who had done the Salkantay, the first day of the regular Salkantay trek seemed to be fairly bland from a hiking perspective. The scenery was cool, but skippable. The Salkantay Trek is of easy-moderate difficulty. The first day there is a climb over a pass (+600m), but the rest of the hike is downhill or flat. With a good GPS map like maps.me, you can easily navigate the trek without a guide. Day 1: At the top of the Salkantay Pass. Nerdy hats optional. July and August (peak season): This is the best time of year to go hiking in Peru. These are the driest months of the year, with less chance of rain and fewer clouds to obscure your view of the mountains. The downside: it’s the busiest time to visit Machu Picchu, with plenty of tourists on the trail and at the ruins. May, June, September, October: Still high season, but with slightly less tourists than July and August. The weather conditions are still ideal for hiking. November to April: Rainy season. There is a high chance of rain on any given day, and clouds will most likely obscure your view of the mountains at some point of the day. That said, we hiked in December and still really enjoyed it. There were also relatively few tourists, which made visiting the ruins very enjoyable! my experience hiking in december - rainy season! We received mixed weather: clouds obscured much of the supposedly gorgeous views on the first day, meaning we didn’t see Salkantay mountain or the views going over the pass. However, the rest of hike was pretty clear, and we got great views coming down into the valley after the pass. We had great weather for visiting Machu Picchu itself! Day 1: Hiking up to the Salkantay Pass. Even though there are clouds hiding the mountains, it made for stunning scenery. The route is unique as it incorporates both hiking and colectivos (minibus) along the way. Note that times are for hiking only, and do not include transportation (bus) times or breaks. We are faster than average hikers, so it may take others longer, based on fitness. Day 1: Camping under a roof in Chaulley. In Cusco you can get a colectivo to Mollepata (marked on maps.me as “Collectivo to Mollepata”). From Mollepata, get a taxi or colectivo up the hill to Soraypampa (this drive is the first day of hiking if you are doing the full Salkantay). The trail starts at Soraypampa. 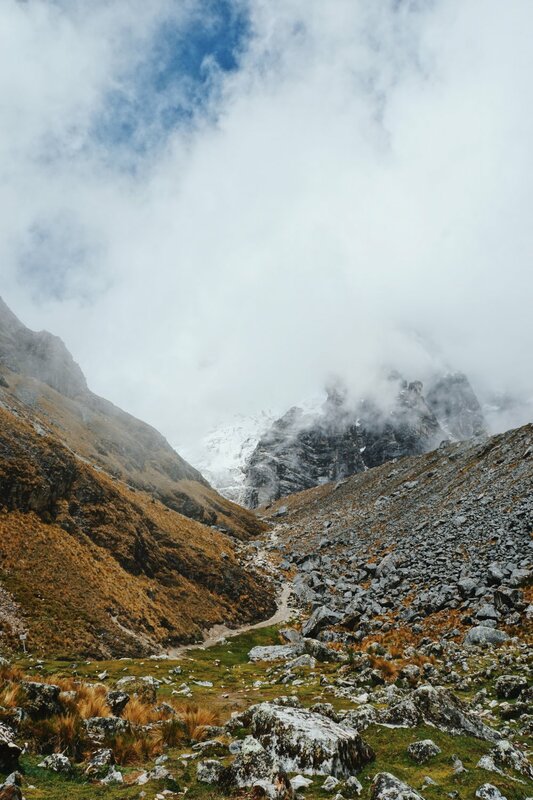 Be careful to take the Salkantay trail, NOT the trail to Laguna Humantay – it's an easy mistake to make as the majority of tourists are walking to the laguna. You start your ascent to the Salkantay Pass (+690m climb; 5.8km). The trail is well marked and not technical. Once you’re over the pass it’s all downhill, and you descend from snow capped mountains down to tropical jungle. Camp or rent a tent/bed at one of the guesthouses in Chaulley. If needed, meals are available for purchase at the guesthouses. Hiking distance: 19km; 7-8 hours. From Chaulley to Sahauyaco, you can hike along the road. There is a trail on the other side of the valley, but as of December 2017 landslides have destroyed the path. We stopped for a fantastic coffee at a little restaurant in Sahauyaco that grows their own beans (can't remember the name, but it has lots of backyard and rooftop seating with hammocks). From the cafe, we paid a tour group bus to drive us all the way to Hidroelectrica. Throughout South America, it’s normal to be able to buy a seat on a tour bus for short trips like this; it's usually the same price as a colectivo running the same route. If you don’t find a tour bus to join, there also colectivos; ask a local for the departure location. "Hidroelectrica" is a train station which links a hyrdoelectric power plant to the town of Aguas Calientes. 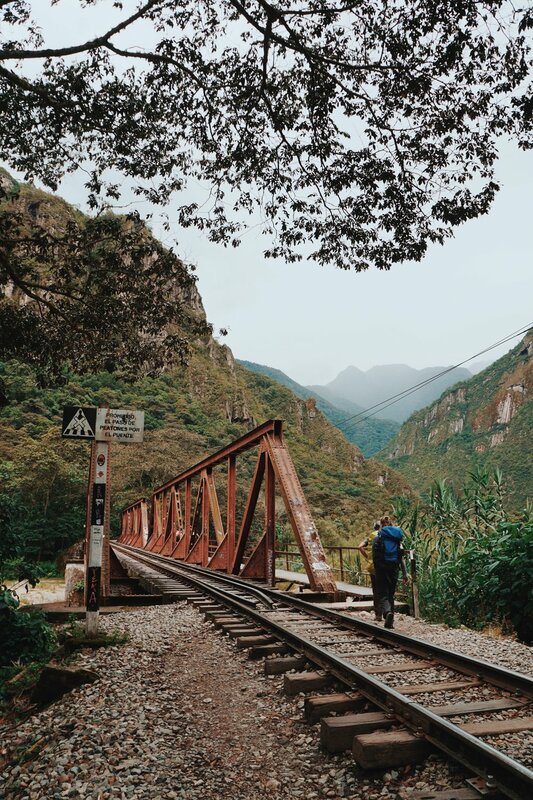 From Hidroelectrica, you walk along the train tracks all the way to Aguas Calientes. It's still a working train line, so watch out for trains! This is a really long day, and I guarantee that your feet are going to hurt by the end of it. Make sure you have a good pair of hiking shoes – I recommend KEEN’s (I previously had this pair and it lasted me 3+ years of hiking!). Hiking distance: 23km; 9-10 hours. Machu Picchu, Peru: Relatively few tourists since we went in low season! The actual entry gate to Machu Picchu is at the top of a mountain; this gate opens at 6:00am. To get to the top of the mountain, we hiked from Aguas Calientes; there is a lower gate near Aguas Calientes that opens at 5:00am. From the lower gate to the upper gate, it’s a 490m climb on uneven steps. It took us 45 minutes with heavy backpacks and we were racing up; most people go slower and take over an hour. I highly recommend being at the upper entrance gate by 6am when it opens, as this is when the weather is best (less clouds, better visibility) and there are fewer people. Clouds often obscure the view in the late morning and afternoon. After exploring the ruins, hike down into the valley via the same path you came up on, and follow the train tracks back to Hidroelectrica. From here, you can take a colectivo or shared taxi back to Cusco. Hiking distance: 13.2km 5-6 hours. Prices are per person in Peruvian soles (PEN), unless otherwise specified. All the prices are ones we bartered for; the prices you will initially be quoted will be MUCH HIGHER! As a rule, you should barter for pretty much everything in Peru. *It may be possible to make a deal with your Cusco-Mollepata colectivo driver to take you all the way from Cusco to Soraypampa (where the trailhead starts). We did this, and in total paid 115 soles for 3 people. Other optional prices below. We chose not to do any of the Machu Picchu add-ons as it didn't seem worth it for us. do you need to buy machu picchu tickets in advance? People often freak out about buying their Machu Picchu tickets in advance, but for most days of the year this is completely unnecessary. We bought ours in Aguas Calientes the night before visiting the ruins. There are a handful of days a year when it actually sells out, and these are in high season and on national holidays. If you go on the official government website, you can view how many tickets are left for any given day. Note: the website is not the most reliable, so be patient if you're having problems with it working. My advice: If you're going in shoulder or off-season, or have a flexible schedule, there is no need to purchase in advance. If you have a set schedule or are short on time, book your ticket in advance to avoid disappointment. Online on the official government website. In Cusco, at the official government office: Dirección de Cultura Cusco (Av. de La Cultura 220, Cusco). Opening hours: 8am - 4pm; Monday - Saturday. In Aguas Calientes, at the official government office: Ministry of Culture (Ave Pachacutec, Aguas Calientes). Opening hours: 5:30am - 8:30pm; everyday. We have all our own camping gear, so we paid a small amount of money to camp in the backyard of a guesthouse on the first night of the trek. The second night we stayed at a hostel in Aguas Calientes (the town nearest to Machu Picchu). If you don’t have your own camping gear, you can rent a makeshift tent or hostel bed at one of the guesthouses along the trail. These guesthouses also provide food and snacks if you didn’t pack your own. do you need a guide to visit machu picchu? We had heard from multiple people and sources that you need a guide to visit Machu Picchu. This is simply incorrect, as we walked in and were originally exploring without a guide, as were many other people. However, we decided to hire one once inside so we could get the most out of the experience. I recommend hiring a guide just outside the main entrance to Machu Picchu, as you’ll be able to barter the best deal. 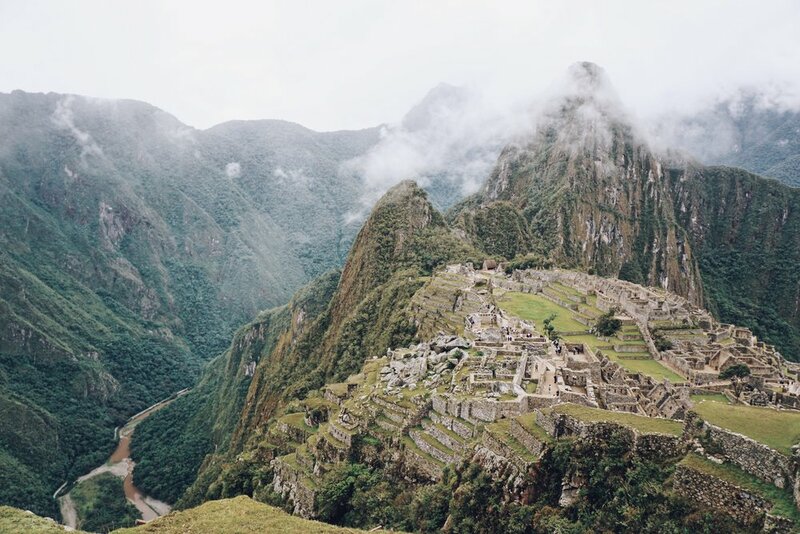 Questions on planning your trip to Machu Picchu? Drop us a comment below or say hello @nutritiontraveller. Post updated on November 20, 2018.